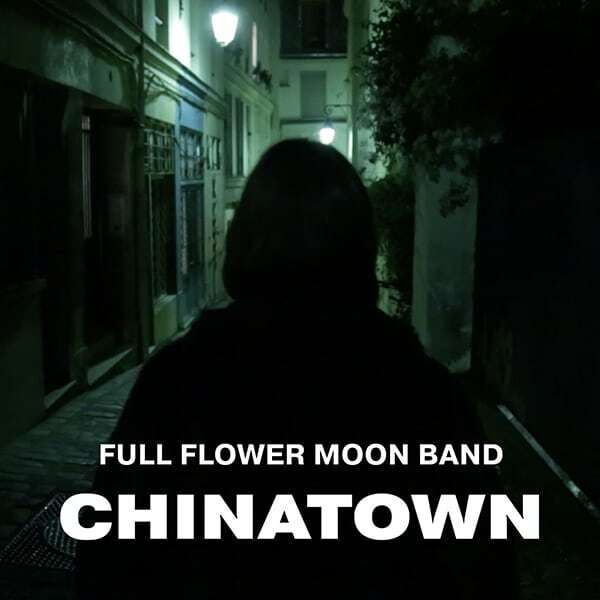 Welcome to the bewilderingly artful experience of Full Flower Moon Band’s audio-visual concept album, Chinatown. 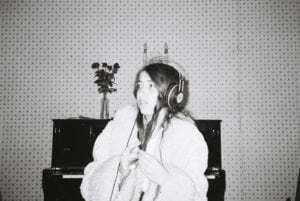 And if you aren’t familiar with the indie rock scene in Australia, you might not know that this band, and its ambitious debut project, is the brainchild of a person who goes by the name Babyshakes (but who is actually named Kate Dillon). Babyshakes, as a part of Gabriella Cohen’s band, opened for Foxygen’s touring production of “Hang” last year at the Fonda Theater. And although Cohen may have also helped Babyshakes record Chinatown, make no mistake, Full Flower Moon Band (FFMB) is very much its own entity. Whereas Cohen makes hazy, laid back, catchy garage rock, the music of FFMB is melancholic, dreamy, gothic, and raw. Quite unsurprisingly, her movie flows into similar territory, with extra doses of quasi-esoteric abstractionism. It is not necessarily that the film is totally incomprehensible, in that it feels like repeated viewings could very well yield answers to many questions. The movie is simply packed with expression, operating on multiple levels at once, and requiring that you be fully engaged. There is the sense of real, deeply deliberated meaning at play. Eager to discover more about that meaning, Concert Guide Live sought out Babyshakes for a conversation about her passion project, to which she graciously agreed. You can watch the film HERE before reading why it feels like there’s something more going on, what authentic art means to Babyshakes, and how Chinatown represents her journey both as a person and as an artist. CONCERT GUIDE LIVE: I definitely picked up on a lot of the thematic stuff in the movie, such as the questioning of authenticity and art, what is real, etc. But I also feel like I just have more questions than answers. Was the point to confuse us? BABYSHAKES DILLON: Yeah well at the end of the day, the [movie] is supposed to sort of leave you with this feeling that you didn’t see the whole film. And the reason for that is because I based the movie in the future where you have to have a certain amount of artistic credit in order to view it. CGL: So, basically there is no real truth to art? Only what you get out of it? BD: Yeah, exactly. I’m glad you got that. CGL: Then what makes art authentic? Is there such a thing? Or is it all lost in translation? BD: I’ve always strived as the artist to be authentic, but the more I create, the more I realize, ‘It’s still Hollywood, baby’. It’s still smoke and mirrors. So, I guess you have to strive for authenticity in your process? 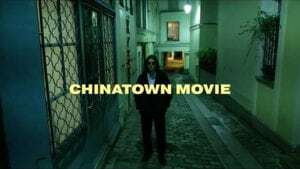 Which is another reason why Chinatown is a documentary about the movie that you’ll never see because I’m trying to say the journey is more important than the destination. CGL: I’d like to touch on that structure for a second. I feel like there’s a lot of self-referential writing these days, to the point where it kind of feels inauthentic and overplayed. Not that I’m saying yours did, but I am curious what your thoughts are on “meta” art? BD: It makes it really hard for artists to find an authentic voice because you can constantly break that wall and be like, ‘Hey, I know what we’re all doing here’. I did break that wall a lot of times, but I did try to keep it contained within the movie dialogue. As opposed to it actually completely breaking down so that I hope I never broke it down to the point of irony. I hope I kept it within its own art. I think my next work will not be as “meta.” But I think I had to work through that in order to realize that my art is valid as a product. I also just didn’t really have the money to make Chinatown the movie and so I had to make a film within a film. CGL: There were moments where that got really crazy though. That interview scene felt like it was obviously acting. But it was also supposed to be real life. So, it was like art imitating life imitating art. And my mind was just blown away. BD: Okay, so, I really had clear visions for this film that didn’t get realized (laughs). So, what I ended up with is like, triple the intensity of what I probably would have wanted to make, simply because it’s my first film. So, when I’m doing an interview and I want it to look real, it still looks fake. But that’s probably a blessing in a way because it’s authentic in the way it reflects where I’m at as an artist. You’re seeing what I tried to do, and the journey that I wanted to show, but you’re kind of seeing the journey of me doing that. CGL: A journey within a journey. I like it. How do you think that plays out for your audience though? Did you write it with them in mind? Or do you have to forsake audience to make authentic art? BD: I feel like you really do have to forget about your audience. Because they might not always be there. CGL: Right. And if you only make art for other people, then you kind of get trapped in this box of identity. Because now you’re having to live up to this idea of you as a certain type of artist instead of you living up to who you already are. BD: Okay, I think I know what’s going on. So clearly there are two phases of creativity, the zone where you’re making the art and you’re creating a vision that you want to make for the world. And then, when that project or that idea is completed and you’re happy to sign off on it. Then there’s the promotion and the marketing campaign. Don’t get the two confused. I mean, there’s no point thinking about how it’s gonna be received and what your press shot is gonna be or what blog is gonna premier it if it’s not made yet. And I think I really had to “go into the mountains” and make it. Then there was this clear distinction to me when I stopped making the art and started making the brand. They’re two different things. There’s a lot of people who have a brand but don’t have any art.